Paul Erickson. The World the Game Theorists Made. University of Chicago Press, 2015. In recent decades game theory—the mathematics of rational decision-making by interacting individuals—has assumed a central place in our understanding of capitalist markets, the evolution of social behavior in animals, and even the ethics of altruism and fairness in human beings. With game theory’s ubiquity, however, has come a great deal of misunderstanding. Critics of the contemporary social sciences view it as part of an unwelcome trend toward the marginalization of historicist and interpretive styles of inquiry, and many accuse its proponents of presenting a thin and empirically dubious view of human choice. The World the Game Theorists Made seeks to explain the ascendency of game theory, focusing on the poorly understood period between the publication of John von Neumann and Oscar Morgenstern’s seminal Theory of Games and Economic Behavior in 1944 and the theory’s revival in economics in the 1980s. 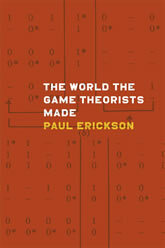 Drawing on a diverse collection of institutional archives, personal correspondence and papers, and interviews, Paul Erickson shows how game theory offered social scientists, biologists, military strategists, and others a common, flexible language that could facilitate wide-ranging thought and debate on some of the most critical issues of the day.